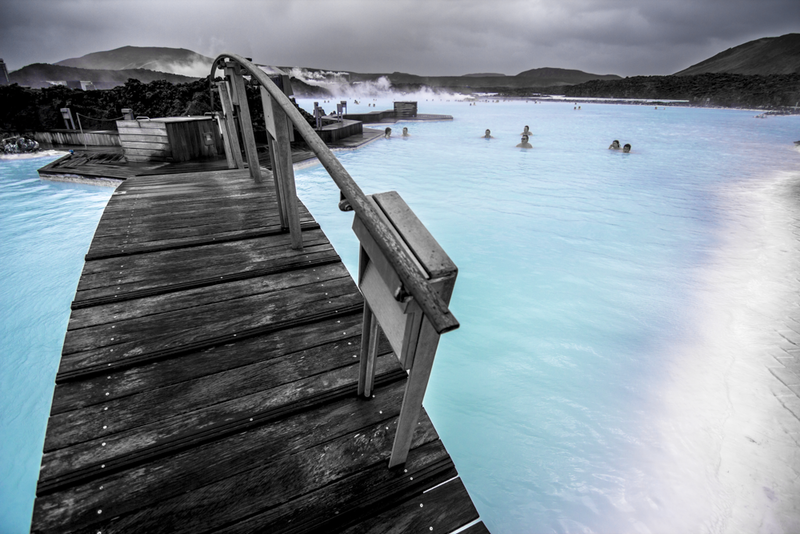 Iceland Day 6: Blue Lagoon and goodbye - Plethora, Etc.Plethora, Etc. Our seventh and final day in Reykjavik – the feeling is bittersweet. Though a short trip, each day was so action-packed that the trip somehow managed to feel much longer. Early that morning, we catch a shuttle bus from the Hilton to Blue Lagoon – our last destination before we fly out of Reykjavik. Thus, Blue Lagoon was born (or, perhaps more accurately, made). And while it is entirely man-made, it’s nonetheless incredible – rich with silica, packed with algae, and absolutely beautiful. Guilty as charged – I took pictures of the moss along the pathway leading to Blue Lagoon. The water is captivating and almost opalescent; depending on the location and lighting, it shifts from a semi-opaque white blue to a true aqua. After showering off and stowing our belongings in the locker room, we sunk down into the warm waters and luxuriated. A blustery, cold wind swept across the surface of the lagoon – it chilled the water on our skin and left goosebumps in its wake, so we sought out warmer pockets of water. We soon figured out the locations where the hot water was being pumped in and planted ourselves there, reveling in the relaxing warmth. Along the sides of the lagoon, long ladles can be used to dole out the mineral-rich mud from lidded containers. Cold, milky white and flecked with black, it looked deceptively like semi-melted cookies and cream ice cream, but smelled incongruously of eggs. We smoothed the chilly mud on our faces, arms, and backs, then settled back water. Our bodies definitely needed this – decompression after the bustle of the last few days. At one end of the lagoon, you can stand underneath a waterfall for a massage – it pummels your head and shoulder-blades in an incredible torrent of warm water. John stood underneath it for minutes on end, eyes closed and hands hands upturned in a zen-like state; he had very clearly found his happy place. Our trip was amazing, and we’d only scratched the surface of things to do in Iceland, or even in Reykjavik. We’d seen Snaefellsness peninsula and the Golden Circle, ridden Icelandic horses, and experienced some of the best food Reykjavik has to offer, and yet there were still other adventures to be had: glacier hikes and dogsled tours, driving the ring road and seeing the Northern lights, walking the black sand beaches and visiting volcanoes… there are so many things to do, and so many things we want to do. < Even Tony the photographer's tales of the midnight summer sun filled us with wonder and a desire to return - to take more pictures, to steep ourselves in the Icelandic ethos, to feel an affinity for this land which somehow manages to be harsh and vibrant and lush and hauntingly barren. Iceland, we will definitely be back. You can count on it.